Nintendo's brighter, faster (and more fingerprint-friendly matte coloured) new DSi handheld continues to fly off the shelves in its homeland of Japan, with one enterprising customer kindly taking the thing apart to discover just what is causing the increased drain on its battery life. 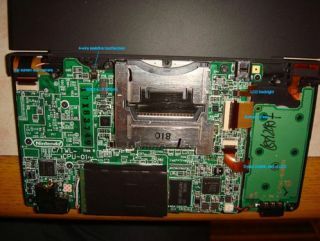 Nintendo originally cited the reason for the DSi's shorter battery life on its slightly bigger, sun-friendly bright screen, but over on Bunnie's Blog there is another suggested reason for the power drain – the beefed up processor. "Compared to the DS-lite, it's a little bit thinner, isn't compatible with the old charger and more prominently features Wi-Fi connectivity status. The speakers are also a bit beefier," writes Bunnie. "Finally, the feature I like the most is that the screens are a good bit larger than the previous model (I'm already enjoying Tetris on the bigger screen). Oh, and also, it has an SD card slot, so you can play AAC-encoded audio from the memory card." Bunnie notes that the DSi's CPU is "substantially beefed up" in order to help it perform all the "real-time image manipulation tricks on the video feeds", as well as the "built-in minigame for audio streams where you can loop in samples over music files and do some low-quality pitch distortion on the fly." "Looking forward to the homebrew scene on the DSi — I think it looks like a really capable platform and could have some very exciting applications, especially with Linux on it."